Star India, has launched a Star Plus application (for their popular Indian TV channel) for iPhone and iPads. The app is available in India and 120 other countries across the globe and can be downloaded from the iTunes App store for a price of $0.99 (approx Rs 49). "Our entry into the iPad, iPhone App store will enable our upwardly mobile viewers to watch their programs on iPhone and iPad wherever they are and whenever they want to," said, Sanjay Gupta, COO of Star India. 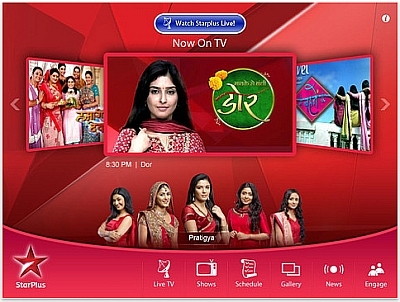 With the application, viewers can choose to either watch Star Plus Live or catch up on previous episodes of their favourite shows that they missed. They can also get updates on upcoming shows, latest schedules and read about what is happening on the channel in general. Fans have the option of sharing their views or commenting on the shows of their choice and if they want, they can also connect with their favourite characters via listening to their audio blogs. Additionally, they can also view their latest pictures and exchange messages with them. "With the Star Plus app discerning viewers can access entertainment content on their iPhone and iPad. The app also allows users to watch episodes, gives details on show schedules, news and updates on their favourite show characters through daily audio blogs," added Lalit Bhagia, VP, Digital, Star India. As of now the app is only available for Apple devices; that too a different one for the iPhone and iPad and not a single one that is compatible on both. Maybe in the future the company will launch an app for Android devices considering that the Android operating system is very popular on both smartphones and tablets.